Located in York, PA, KBS Inc has offered superior bulk transportation service throughout the eastern United States since 1969. Our primary areas of service include Baltimore MD, Hagerstown MD, Pittsburgh PA, Philadelphia PA, Harrisburg PA, Scranton PA, Allentown PA, Wilmington DE, Newark NJ, Camden NJ, Richmond VA, New York, West Virginia and Ohio. 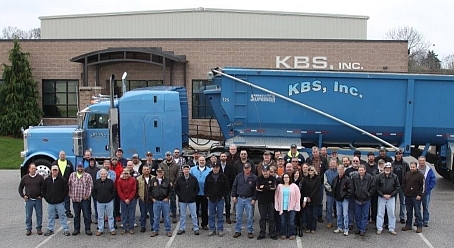 K B S, Inc. is a premier dump truck service transporting bulk commodities, raw materials, construction and demolition waste, scrap metals, stone, landscape material and more. Our fleet includes tri-axle dump trucks, tractor trailer end dumps, push out trailers, and walking floor trailers. We have steel and aluminum bodies, frame and frameless trailers, waterproof tarps and control flow two-way tailgates. We also provide import and export container transportation and drayage to and from the Port of Baltimore, including Seagirt Marine Terminal. We take pride in the quality of our top soil, both screened and contractor grade. We can deliver to your home or job site, or you are welcome to swing by with your own truck to pick up a load. © 2008 KBS, Inc. All rights reserved.